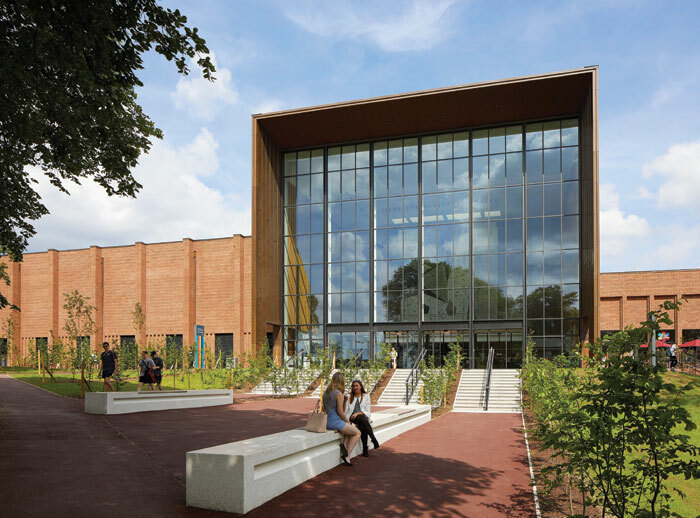 Lifschutz Davidson Sandilands has delivered the Indoor Sports Centre at the University of Birmingham. 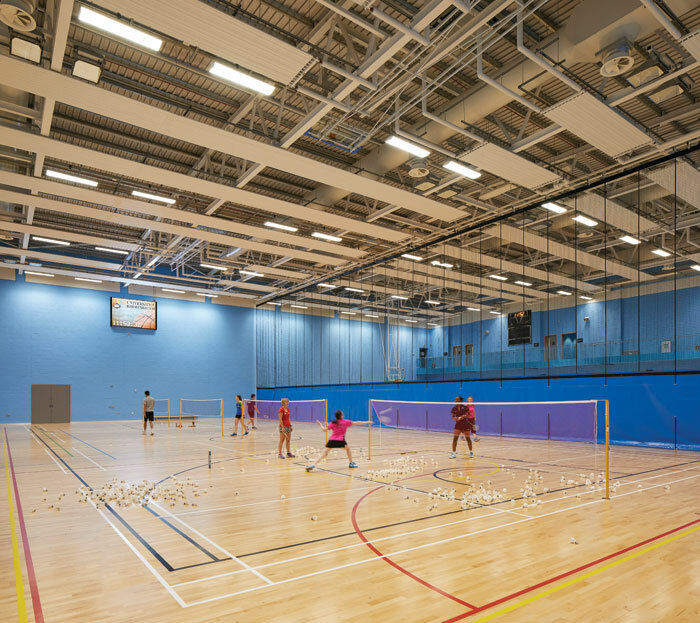 Open to students, academics and the public, the complex incorporates Birmingham’s first Olympic-standard swimming pool, together with a range of sports halls and gyms, labs and testing facilities. The project also meets ambitious energy performance targets, particularly for a swimming pool, and makes optimum use of natural light. The brief also stated the project needed to deliver a breadth of activities, programmes and services under one roof through a range of functional and flexible spaces. Located on a former brownfield site adjacent to the Edgbaston Conservation Area, the centre forms a gateway to the Edgbaston Campus. Its location, positioning and design had to be considerate to a number of key factors and buildings that surround it. ‘The land is adjacent to a Conservation Area on the east boundary, and close to the Grade II listed University House and South Gate,’ explains Sandilands. ‘The Guild to the north, while not listed, is an attractive historic building, and the iconic Chamberlain Memorial Clock Tower by Sir Aston Webb rises 100m and marks the formal and symbolic heart of the university to the north-east. The building’s facades are made of high quality bronze and brick and articulate openings and entrances. The design evokes a strong civic identity with informal access along a colonnade to provide public views to the pool and drawing pedestrians away from the polluted junction of the neighbouring A38 road to a new, landscaped approach to the university. 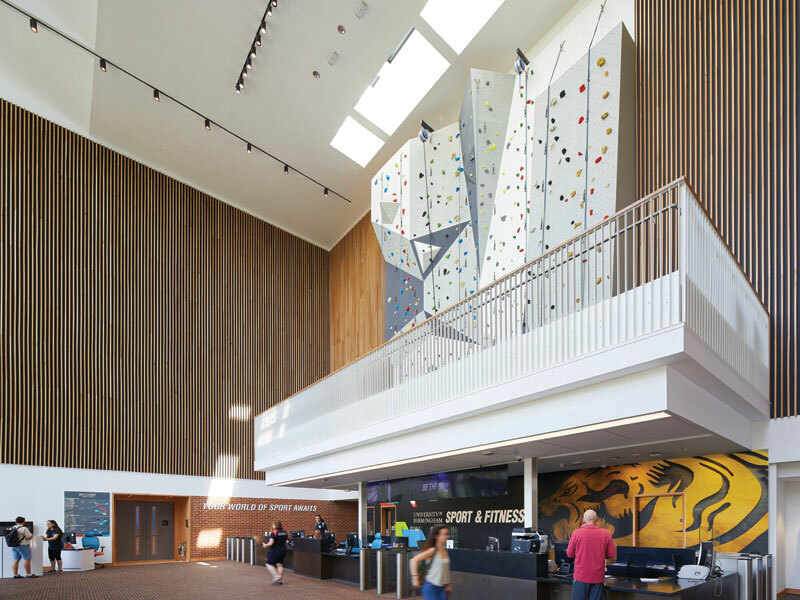 Once inside, there are views between the gym, pool and sports hall, and the reception desk is surmounted by a dramatic climbing wall. The scheme is designed to achieve an Environmental Performance Certificate A rating and a BREEAM ‘Excellent’ rating. 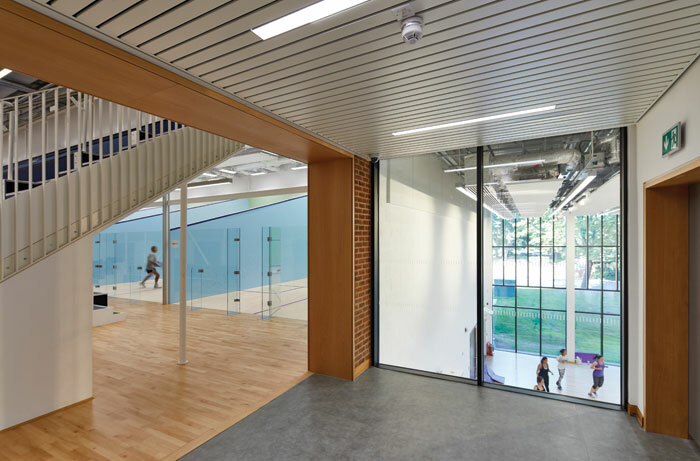 A simple internal layout of spaces and structure, together with an inherent flexibility, is an important aspect of the centre’s sustainable credentials, while each sports area has an efficient and flexible layout. Good daylight in the heart of the building significantly reduces the projected CO2 emissions by artificial lighting and greatly enhances the user experience. Natural ventilation in spring and autumn will also reduce energy consumption. In summer, cool night air is introduced into the building to lower the temperature of the exposed thermal mass of the fabric and to dampen heat gains the next day. 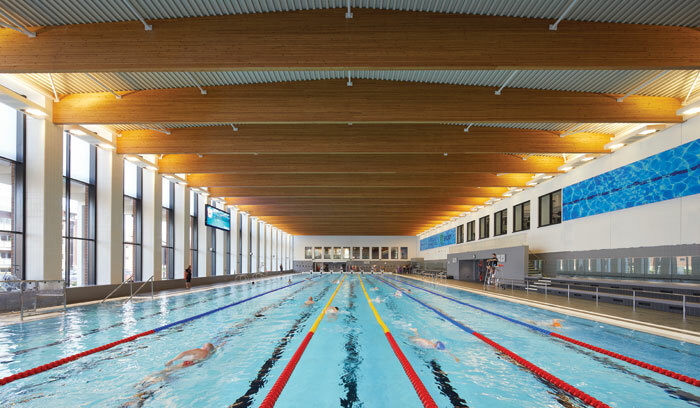 When large crowds of spectators attend the sports hall, a natural ventilation ‘boost’ facility – powered by dedicated PV panels – improves summer conditions. A heat-recovery system also allows the ‘boost’ to be used in winter.